About us | Premako, a.s. 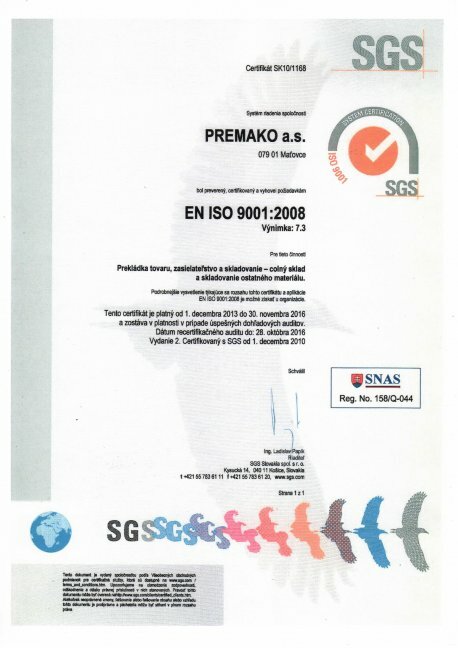 The joint-stock company PREMAKO a.s. with its seat and workplace in Maťovce and offices in Košice, as well as Moscow, was established on 26.07.1993. It is an international company with direct business contacts in the Czech Republic and the Russian Federation. PREMAKO a.s. has been operating in Maťovce – located 2 km from the Ukrainian state border and 1 km from the city of Veľké Kapušany- for more than 18 years, an international multimodal logistic and transloading centre (hereinafter referred to as ILC) with its own rail spur. Railway station code for Maťovce is: 56/168708. ILC covers the area of more than 30 ha. Currently, PREMAKO a.s. is cooperating with co-investors in extending and completing of the logistic park which will be enabled to provide logistic support, in terms of import and export, to the EU companies, as well as to the companies from the CIS. The ILC has its own trailer with gauge of 1520 mm and 1435 mm, storage places and infrastructure for trucks. The company specializes in transloading of the commodities imported or exported from/to the Ukraine, Russia, Moldova, Kazakhstan, and China, as well as from/to other countries with rail gauge of 1520 mm. In the ILC, it is possible to transload all sorts of commodities except from, pumping of liquid commodities and transloading of loose materials from/to special self-emptying wagons (chopper). The company introduced the Quality Management System according to standards of ISO 9001:2008 in all crucial activities: transloading, storage, and logistics in 2004 and has been maintaining it ever since. 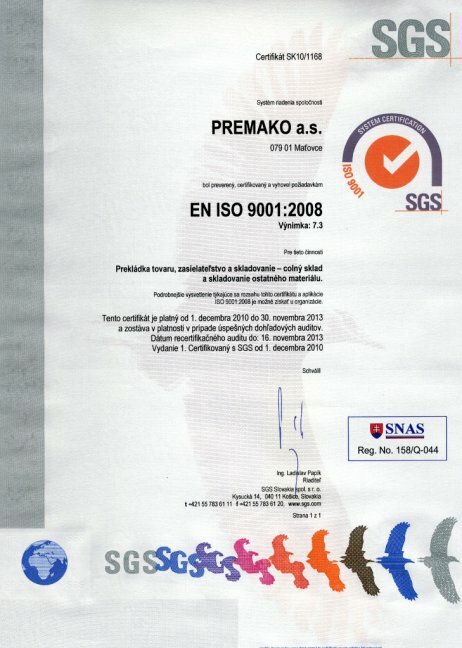 PREMAKO a.s. is a member of Association of Forwarding and Logistics SR.